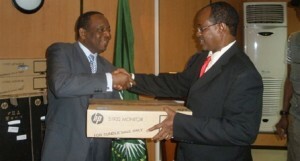 30 avril 2012: In the framework of the effort to enhance coordination and cooperation between AMISOM and the Somali Transitional Federal Government (TFG) and to support the newly launched AMISOM-TFG Fusion and Liaison Unit (UFL), the AU Chairperson Special Representative in charge of Counter‐Terrorism Cooperation and Director of the African Centre for the Study and Research on Terrorism (ACSRT), Ambassador Francisco Caetano Jose Madeira handed over, to AMISOM-TFG, communication equipment consisting of desktop Computers and a fax Machine to ensure continuous flow and exchange of information between AMISOM, the TFG, Troops Contributing Countries (TCCs) and other stakeholders to enable better information collection and analysis to provide accurate intelligence to the troops on the ground and develop better strategies to overcome the challenges faced, including building public support of local populations. Moreover this would ensure connectivity between the Somalia Mission UFL and the Sahel UFL. It is to recall that this comes two weeks after the launching of the AMISOM-TFG Liaison and Fusion Centre in Mogadishu and one week after the training course on “Principles and Methods of Police Evaluation: Operational Analysis,” organized by the ACSRT with the support of the German Federal Police (BKA), which drew, among others, officials from the Sahel countries (Algeria, Burkina Faso, Chad, Mauritania, Niger, and Nigeria) and the Sahel UFL, the Mission Analysis Mission Cell (MAC) of the African Union Mission in Somalia (AMISOM) and the Somali Transitional Federal Government (TFG)/ Somalia’s National Security Agency (SNSA). Information sharing is already bearing fruits as joint AMISOM and TFG operations have enabled the defeat of Al‐Shabaab terrorists in the Daynile area with minimum casualties on our side. The Joint Fusion and Liaison Unit will further strengthen coordination between AMISOM and the TFG and ensure the effectiveness of the fight against Al-Shabaab terrorists. The ACSRT, the Countries of the Field, the Sahel and Somalia UFLs, the TFG-SNSA and AMISOM will continue working together to further strengthen African Member States’ counter-terrorism capacities.